Pouches carried around every day, you like your favorite surprises! I am happy to see it, I am glad to show you, I like to carry around with a braided pouch. Pouches carried around every day, you like your favorite surprises! I am happy to see it, I am glad to show you, I like to carry around with a braided pouch. Make Liberty prints like ribbons, We knitted a human hill and produced a new pattern. In order to make full use of the coloration of Liberty, we are proceeding to make it possible to express the front side of the fabric in all stitches. Therefore, the stereoscopic feeling of the stitch is very gorgeous. At that time, I am progressing with thinking about the most beautiful color pattern gradation. You can not make exactly the same thing again. The surface bloomed with one side of Liberty blooming knitting, blooming knitting corsage with haute couture beads bloomed. The back is a cotton blossoming knitting. When you split the cotton fabric, you can make a lot of Kebabeba fringe, and a different texture will be created again. It is a dyeing fabric of the gradation, compatibility with Liberty is also outstanding. The gore part is denim. All hand sewn finish, it is a sticking commitment design that makes no seams at all. Each denim has a texture, you finish in your own porch. Of course inside cloth, of course Liberty. Every time I open it I am choosing a stingy pattern and making it. Since there are also cushioning properties in the blooming pouch, I will gently protect the precious small items that will be in the pouch. Fasteners are specially ordered one color perfect for a pouch. With coloring that does not float from the cute pouch, excitement does not stop even when opening and closing. Blooming and knitting motifs are wearing in hands too. I make it sticking to details. No one has it, your only sticking porch. Carry around, take out, look, show, use, It is a pleasant pleasure of you. 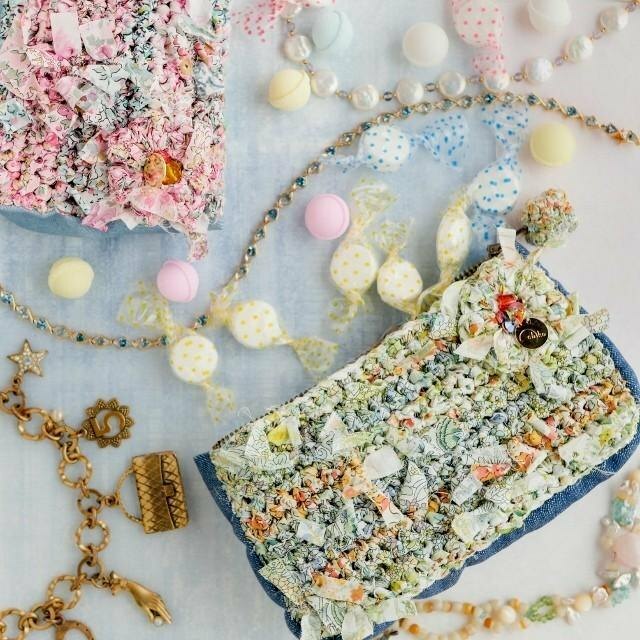 【Color】 Refreshing lime and yellow Liberty gradation 【Size】 Horizontal 16 × vertical 10 × gusset 4 It is easy to carry around with the palm size. Mirror in the lip, secret snack ... What can you put? ◎ Fixed Free Warranty ◎ Because I want you to use more and more, blooming knitting pouch, blooming knitting bag, you will receive a free rework. We will install a free warranty card, so please keep it in a safe place. Some parts, such as when it is necessary to exchange parts, may be paid, but please contact us any time you need help. - We will accept orders made with pleasure, such as color and size. Please do not hesitate to contact us. ● We have created the organdy cloth by splitting it, so there is a keba dachi. Kebabeba may fall, but as you use it, it becomes difficult for the fibers to fall and fall, so please enjoy listening to the texture.